Climate change is bad for business; unless you happen to corner the market on fresh water or profit in some way from calamity, climate change is best debunked and ridiculed. Dismissive snorts escape big business boardrooms Bottom line dollars, and profit regardless of impact make the subject far too treacherous to acknowledge. Global warming reached its zenith with Al Gore – An Inconvenient Truth ranked as one of the highest grossing documentaries of all time. Sharing in a Nobel prize and Oscar helped to propel his message into the consciousness of millions. Cynics might argue the millions he profited along the way emit a mighty “green” stench. Sure his personal wealth hit the jackpot – from a couple of million as Vice President to hundreds of millions investing in “green” technology companies. Just because he gained from companies supplying carbon emission testing equipment to industry, smart meters or sustainable energy technology doesn’t make him a piranha. His twenty room, eight bathroom mansion uses more electricity in a month than the average household uses in a year – at least he got us thinking, right? I’m not pondering Gore’s legacy or corporate denial. This isn’t about pointing fingers, laying blame or splitting hairs. Sure I’m disgusted by big business smoke screens – tactics used by each and every interest with something to gain or loose, from governments to the private sector – stir the pot, divide the masses, create confusion, and avoid reality long enough to keep the money rolling in. Scientists are tracking a massive warm water anomaly in the Pacific Ocean. Large enough to cover the United States to a depth of 300 feet, this troublesome “blob” typifies changing weather patterns. At the moment a “sub-surface”event, quickly poised to become a formidable El Nino as wind and ocean currents push it closer to the surface. 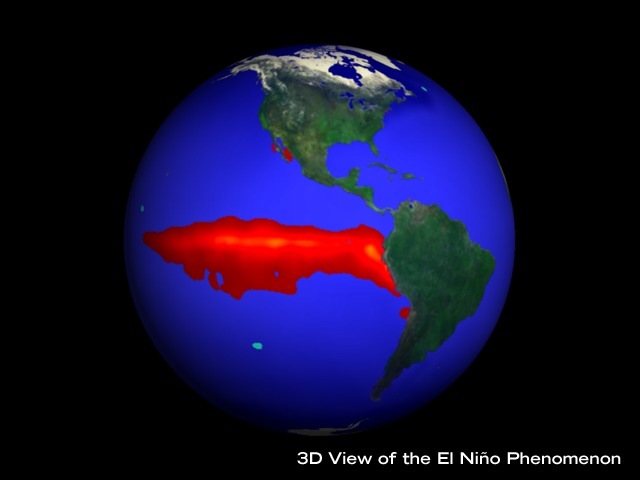 El Nino is characterized by warmer than average ocean temperatures in the Pacific ocean. Warmer ocean means warmer air, and warmer global temperatures. El Nino years see dry countries flood – increased water a breeding ground for insect populations like mosquitoes which spread disease. Wet countries experience drought – crop failure and forest fires follow. Ocean currents change as a result of wonky trade winds – countries dependant on fishing suffer as “fish kills” or changes in migration deplete fishing grounds. The last El Nino year of 1997 is credited with 23,000 deaths and over 30 billion dollars damage worldwide.